The Mystic Pawn Pincher is a Tactical weapon. 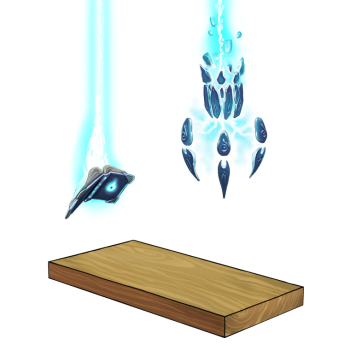 When Mystic Pawns see the glowing energies from this trap, they flock to it, hoping to top up their reserve. The Hunter must then whisper the forbidden words which direct the crane arm, positioning it over the hapless pawn before the allotted time passes. If the spell is said correctly, the runic claw drops down and nabs the Mystic Pawn. Technic Pawn armor is too slippery for the Arcane Crane, making them fall out of the claw before it gets a good grip. The Mystic Pawn Pincher can be purchased for 643,750 gold from the Seasonal Garden Trapsmith. It refunds for 77,250 gold at the same location. The Mystic Pawn Pincher is a special-purpose weapon designed to catch the Mystic Pawn in Zugzwang's Tower while avoiding the Technic Pawn. 26 August 2010: The Mystic Pawn Pincher was released with the introduction of Zugzwang's Tower. This page was last edited on 13 January 2019, at 15:47.